Last month I had the incredible privilege to do a residency just outside of Reykjavik, Iceland, through Samband íslenskra myndlistarmanna (SÍM). I went because the Icelandic landscape is made of extremes--black earth against brilliant green moss, volcanic mountains rising suddenly out of flat plains, bright purple flowers found in the most impossible places, weather that changes in a second, glaciers and steaming geothermal pools. I had a feeling that the forms, colors, and patterns there echoed those in my work, so I had to see it with my own eyes. I spent the first three days traveling South Iceland, where I camped next to a waterfall, hiked up a mountain in Skaftafell and found myself standing above an outlet of the Vatnajökull glacier, the largest in Iceland, visited the glacial lagoon in the stunning moments around “sunset,” which happens around midnight and July and results in a glowing twilight that lasts all night, and drove across miles of open space, punctuated by alpine flowers, streams reflecting the majestic mountains with glimpses of the ice beyond, lava fields, clusters of moss, waterfalls cutting through knife-edged cliffs. I also had the chance to visit the spectacularly rugged Snaefellsnes Peninsula, hike up Mt. Esja, and relax in the “hot river” in the geothermal hills around Hveragerði. A key artistic goal for my residency was to experiment with how I incorporate landscape into my work. The references to natural forms in my drawings and paintings are often drawn from my imagination, so show up as very abstracted references. I have tried to isolate patterns in the landscape and then arrange them into an abstract composition, with varying degrees of success. 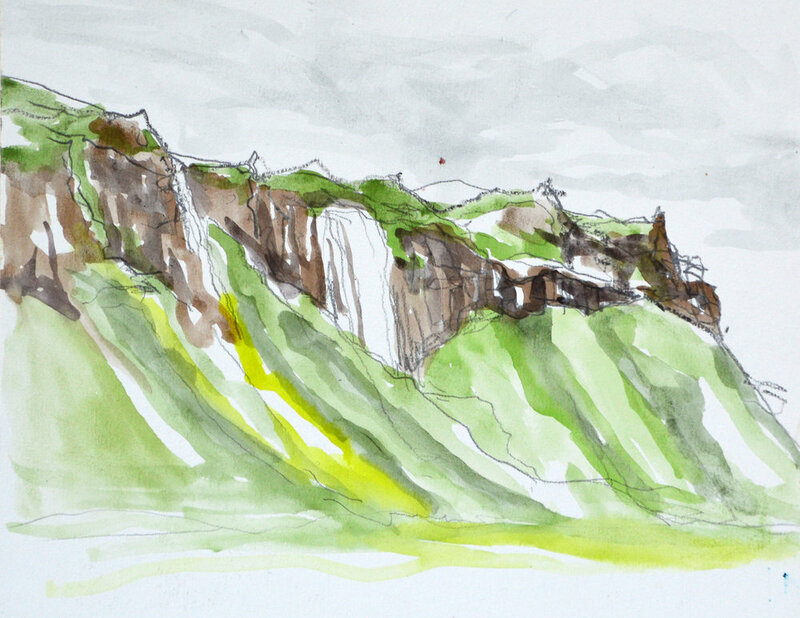 But in Iceland the natural forms were so dynamic that I tried something different; making observational drawings from my photographs to establish composition and then putting away the photo and making a second image that retained the essence of line and form, but was generated using my more gestural process of mark-making. The driving force behind my work is a conflict--between the awe I feel in experiencing the natural world and the fear and sadness about what humans are doing to it. The only tools I’ve come up with to manage this are drawn from Buddhism--mindfulness (staying in the present and appreciating the beauty that is around me) and impermanence (accepting that change is constant). During the tour of Snaefellsnes, I asked my guide about the impacts of climate change on Iceland. He pointed to a glacier and said, “this will probably be gone in ten years.” At the glacial lagoon, I held a piece of ice, just to know that I had made contact with the glacier, even if it was to disappear. Very early on, rock formations emerged as the primary subject. 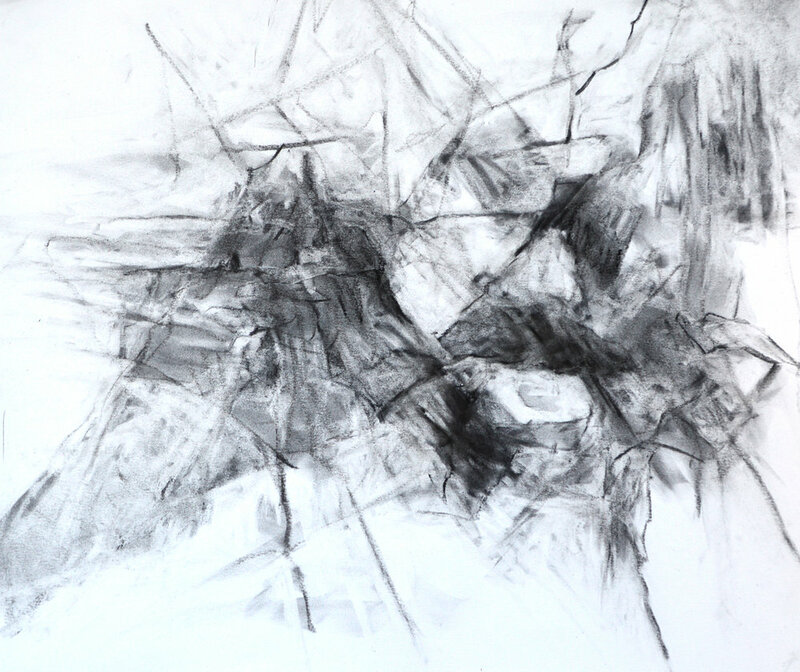 They inspired both the formal and emotional elements of my process: shapes and lines that helped me try new modes of mark-making, and reflections on impermanence. Rocks seem so permanent but they are formed by the most extreme, dynamic, and elemental processes on our planet. I thought about what these rocks have lived through and what they will witness as our planet changes. 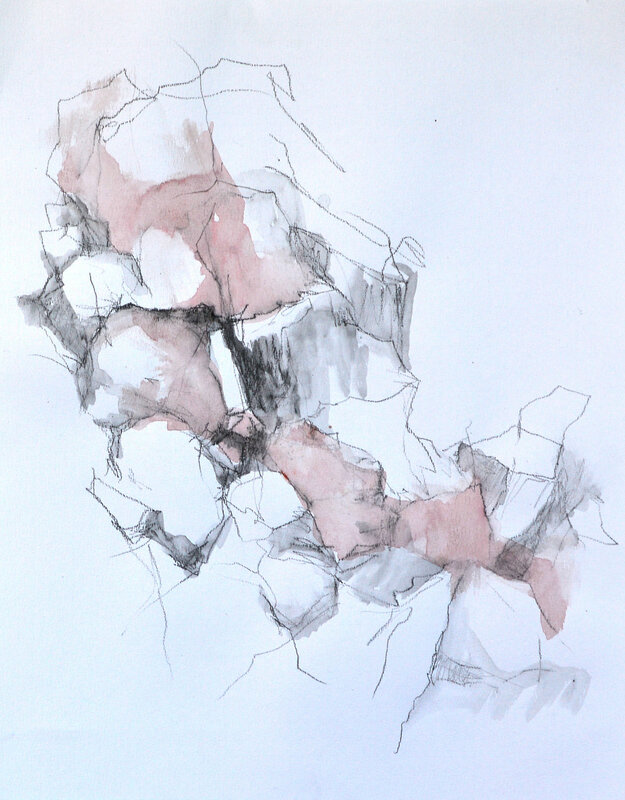 So I returned to the US with dozens of rock drawings in tow, a new artist statement forming in my head (here is my draft), and new ways of thinking about the interplay between abstraction and representation. The biggest luxury residencies offer is time--to reflect, to have the headspace to let inspiration come, to experiment, and, in this case, 24-hour natural light! I am looking forward to seeing where this work takes me, knowing that my experience in Iceland will have a profound influence on my work for years to come.